Hyperbaric medicine is used to treat a wide range of disorders including diabetic ulcers and hard-to-heal wounds, as well as carbon monoxide poisoning, skin infections, and air embolism. Our hyperbaric oxygen therapy (HBO) program is accredited by the Undersea & Hyperbaric Medical Society. For more information, please call 201-894-3898. The Hyperbaric Treatment Center offers HBO therapy to hard-to-heal wounds and diabetic ulcers as well as wounds caused by infections, poison, radiation burns, traumatic crush injuries, and embolisms. This painless procedure is often used in combination with meticulous wound care and antibiotics. Under pressure, oxygen can increase the ability of white blood cells to kill bacteria, prevent the production of toxins, reduce tissue swelling from poor circulation, stimulate the growth of blood vessels, and stop the deterioration of cells. It can also be used before and after bloodless surgery and to sustain tissue flaps and grafts. HBO is relaxing and painless. 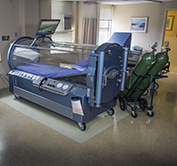 The patient lies on a bed enclosed in a clear plastic chamber. The patient and therapist can see one another and communicate through an intercom. The pressure is set to the prescribed level and the chamber is filled with oxygen. The patient will experience a slight sensation of pressure, like that felt in the descent of an airplane. Each session lasts for up to 90 minutes. For comfort, the patient can watch television or listen to the radio during treatment. Our medical team will work closely with your referring physician to design an individually tailored plan to meet your specific needs. Physicians receive complete documentation and notification of progress. Embolisms, in which air bubbles enter a vein or artery and block it, can occur during surgery. HBO therapy compresses the bubbles, reducing their size and reestablishing uninterrupted circulation. HBO therapy can be used for patients in whom blood transfusions are not an option. This therapy can be used to maximize the oxygen carrying capabilities of a patient’s blood. 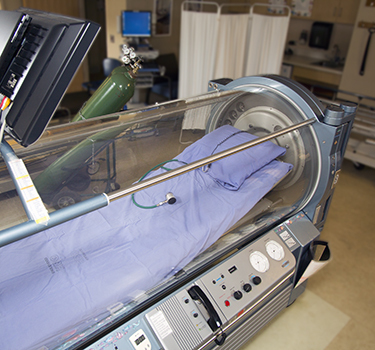 The high pressure of the HBO chamber forces oxygen into the plasma, or fluid component of the blood. This allows oxygen levels in the body to be maintained even when red blood cells are in short supply. When a patient inhales a lethal amount of carbon monoxide, the CO travels directly into the tissues where it attached to and alters proteins. These alterations do not become toxic until the tissues have an inadequate supply of oxygen. Administering oxygen at normal atmospheric pressure does not terminate this process. However, HBO therapy at pressures greater than 2 atmospheres stops cell deterioration. HBO therapy’s role in stimulating capillary growth and increasing the white blood cells capacity to kill bacteria make it an effective aid in the treatment of 2 diabetic ulcers and other hard-to-heal wounds. Diabetics are especially susceptible to these ulcers due to poor circulation, low oxygen levels in the blood stream and rigidity of the blood cells. In addition to increasing the amount of oxygen carried to tissues, HBO therapy also increases glucose and reduces lactose levels, making blood cells more flexible. This allows blood vessels in the body’s extremities. This disease is caused by a loss of blood, which results in dead tissue accompanied by gas bubbles infected by bacteria. These bacteria, which thrive in the absence of oxygen, produce toxins that multiple within the tissues of the body. HBO therapy prevents the production of these toxins, controls the infection, stabilizes the infection, and reduces the need for immediate surgery. HBO therapy can speed the healing process of chronic bone infections and may reduce the chance of re-infection. It is used along with a comprehensive routine of cleansing, isolation of the infection, bone and muscle grafting, and antibiotics. Radiation therapy burns can be treated with HBO therapy. Typically when the body is wounded, blood is cut off abruptly, creating a sudden drop in oxygen pressure and sending a message to the brain to send healing agents and infection fighters. But radiation damage is gradual and focused on the center of the area being treated, therefore the oxygen pressure does not drop abruptly and a message is not sent to send aid to the wound area. During HBO therapy, the oxygen pressure is increased by more than 10 times, which triggers the brain to recognize a sudden decline in pressure at the wound site and direct aid to the site. HBO therapy can be used to fight infection from bacteria that need oxygen to survive. When oxygen levels are lower than normal due to poor circulation, white blood cells are not strong enough to kill bacteria with an “explosion” of oxygen. HBO restores oxygen to the normal level and “super charges” white blood cells by delivering oxygen under greater than normal pressure. Though most tissue flaps and grafts heal without HBO therapy, when a flap loses oxygen it is in danger of becoming unsalvageable. HBO can often sustain the flap until the blood flow can be restored. HBO therapy can also significantly increase new capillary growth after surgery. HBO therapy can send oxygen to greater volumes of tissue and promote new cell growth when a patient has experienced a traumatic crush injury. Although a surgeon can repair large blood vessels, crushed capillaries cannot be fixed. The affected area may swell, limiting circulation even further, so it is very important that crush injury patients receive HBO therapy early, perhaps even before surgery is scheduled.